With a starting price of Only $1095.00 ... Virtually Everyone Can Afford to go Solar! How about starting at $259.00? Click here to see a diagram of a Fireball panel. Does Solar Work in Washington State? Now ...Going Solar is Easy and Affordable! The Fireball 20-01 Solar Water Heating System is designed first and foremost to save you money, year after year. It's smart. Your water heater is the most expensive appliance in your home. Get a safe return on your investment while cutting utility costs. The fuel from the sun is FREE. The system pays for itself in as little as 3 years. It looks smart. The Fireball 2001 is attractive, sleek, long and gives a skylight appearance, complimenting the roofline of your home. A true architectural enhancement, and it's available in colors! The system is centered around a powerful solar collector with a premium black crystal copper absorber. The all aluminum frame is attractive and beautifully designed. The unbreakable Lexan cover is much lighter and safer than glass, and features a ten year warranty from GE. The modular design makes your solar system easily upgradeable. Start with one panel and add more as your family or needs grow. This is a modular system with all materials and easy-to-follow instructions for installation utilizing your existing 40 (plus) gallon water heater. The powerful 20 square foot (20"x12') collector comes in two easy to connect six foot sections, and weighs under 38 pounds. All you need to assemble the system are basic home-owner's tools, pipe insulation and four to eight hours of time for installation in most situations. Most of the work is done for you. The Fireball 2001 is mostly pre-assembled and labeled at the factory. With it's light weight, the slim design is safe and easy to place on your roof. 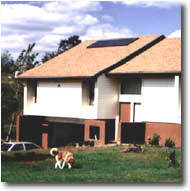 A "Solar Utility," the Fireball 2001 reduces pollution. It shows you care enough to do something to help our environment. One 20 square foot (20"x12') solar collector with mounting kit, 50' of 1/2" copper tubing and tube connections to existing tank, "Easy Connect" kit (with shut off and drain valves) or full freeze protection with thermosiphon heat exchanger, collector pressure relief valve and vent kits, install kit and complete instructions. System 1: 110 volt circulator, timer, light freeze option available. System 2: 110 volt circulator, differential control, has freeze option. System 3: 12 volt circulator with PV panel**, has freeze option. System 4: 110 volt circulator, differential control, and full freeze protection***. System 5: 12 volt circulator with PV** panel, and full freeze protection***. A photovoltaic (PV) circulator that runs purely on energy generated from the sun. There is no need for any utility electricity! 100 percent freeze protection anywhere with a low cost heat exchanger that connects to most existing water heaters with minor soldering. Up to 3 additional collectors, Colors, Tilt kits. Please see the price list. Forget What You Thought You Knew About Solar! The Fireball 20-01 changes everything! Now Going Solar is EASY! to SAVE YOU MONEY year after year! As a "Solar Utility Appliance"
Pays for itselfin as little as three years! Looks SMART! A FIREBALL2001 is Attractive! Its Sleek, Long and LowSkylight Appearance Compliments the Roofline of your Home. IS SMART! Your water heater is probably the most expensive appliance in your home. Get a safe Return On Investment of up to 33% while cutting this cost. Earn Tax Free Money!Most families would have to Earn $430 to have the Tax Free $300 Saved with Solar that they now can spend on better things than Utility Bills! CanREDUCE More Pollution than your car creates! Shows you care enoughto really do something tohelp our Environment! A Smart Inflation Hedgeagainst Utility Price Hikes! The FIREBALL 2001 uses high performance absorber coatings! Ships Anywhere in the U.S.A. at Low Cost Via United Parcel Service! No-Solder-Installation is Easily Done by most Homeowners! Thoughtful Design and Installations make Homeowner or Handyman installation easily done in a few hours by one "handy" person! Added Value! Most of the Work is done For You! Your Fireball 2001 is mostly Pre-Assembled and Labeled for you at the Factory! The attractive, Slim, Design is Safer and Easier to Place on your Roof. Unbreakable Lexan Cover with 10 year Limited Warranty from GE! Much Lighter, Safer and Easier to Install than Conventional Glass. All Aluminum Frame, is Truly Attractive and Beautifully Designed! We take Pride in our Craftsmanship and Quality Materials. Photovoltaic (PV) Pump Option, Run Purely on the SUN! For Care Free Installation, with PV, there is no need for 110V Connections! 100% Freeze Protection with Low Cost Thermosiphon Heat Exchanger option! Easily connects to most water heaters with minor soldering. Modular Design makes your solar system Easily enlarged! You can start with one panel and add them as the Family or needs grows! A Quality System Designed to Last! The Fireball 2001 Collector has a life expectancy of over 30 years! **A photovoltaic (PV) circulator runs purely on energy generated from the sun. There is no need for any utility electricity! ***100 percent closed loop freeze protection anywhere with a low cost heat exchanger that connects to most existing water heaters with minor soldering. NOTE: Your savings depend on your source of fuel, utility costs and available credits. Generally, solar with electric or oil water heaters provides the fastest return on investment. Propane returns can be good with Natural Gas currently providing the lowest returns. SolarRoofs.com or your dealer can provide you with a solar return analysis. In any event, what you contribute to cleaner air is priceless! ORDER YOUR FIREBALL 2001 NOW!